Over the last decade, the popularity of dash cameras has grown immensely; in fact, millions of drivers all over the world install them in their vehicles to record as they’re driving. In addition to private cars, dash cameras can also be found in the majority of Uber, Lyft, taxi cabs, and other vehicles for ride-sharing services. There are so many hazards on the road that it only makes sense that you’re interested in learning more about dash cameras. Hence, we’ve conducted a thorough review of the Rock Space N56 Dash Cam, so if it’s on your list of potential cameras, this is a great place to learn everything you can about the Rock Space model. The Rock Space brand started manufacturing high-quality protective items for cell phones and tablets. In just a few short years, they’ve managed to collaborate and grow partnerships with some of the world’s most leading brands such as Samsung, Sony, and Nokia. Now, with over ten awards under their belt, Rock Space and their talented and innovative production and research development teams have worked their way into different markets. With a priority of providing their customers with high-quality products at reasonable prices, the Rock Space N56 Dash Cam is just one of many devices you can now get to satisfy your technology needs. The Rock Space N56 Dash Cam was made for drivers who want a little extra protection while they’re on the road. Driving is unpredictable, and this camera is there to ensure you remain protected against collisions that aren’t your fault, as well as unwarranted tickets. They can also defend you against potentially harmful allegations if you are in the ride-sharing business. 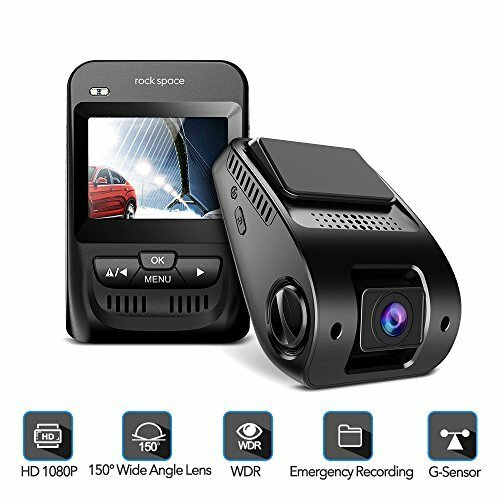 Having the Rock Space Dash Cam is also great if you’re a parent with a child who is new to driving since it lets you see how they are behind the wheel, and keeps you both protected should a collision happen. Before we get into telling you what Rock Space included with their N56 Dash Cam, we do recommend that you purchase a micro SD card, a micro SDS card for a USB adapter, and an auto 12V extension cable. Those additional purchases are going to help enhance your dash camera experience. That said, what you can expect to receive in the package is the product itself, a user’s manual that is slightly confusing, power cables, and the 3M adhesive stickers. Fantastic features come with the Rock Space N56 Dash Cam. The device itself is set up to record at high-definition 1080p with a 150-degree wide-angle lens. The lens is an F2.0 6 glass lens and the popular Sony IMX323 CMOS image sensor along with the WDR and HDR work together to help ensure the utmost clarity of your footage regardless if it’s day or night. The G-Sensor automatically saves and locks any videos that are recording whenever a collision, harsh slam to the brake, or violent bump is detected, so the files don’t get overwritten. Likewise, the loop recording feature overwrites all unnecessary files, so your dash cam can continue to record even if your micro SD card is full. The built-in gravity sensor starts the emergency recording mode whenever there is an unexpected incident. Even if you aren’t recording at that time, your dash cam turns on. The N56 also features a 90-degree up-to-down lens, letting you change your viewing angle. It is designed to work under harsh climates that range from -4 degrees Fahrenheit to 158 degrees Fahrenheit. Additionally, the dash camera comes with a one-year manufacturer’s warranty that protects you against any default in the product. How to Clean Your Dash Cam Lens? There are a variety of recommended ways that you can use to ensure your dash cam lens remains clean at all times. After all, what’s the use of having one if the footage is just going to be obstructed because of a dirty lens or windshield? Even though the lens is likely made from glass, using Windex is a no-no since it does leave a residual oil that can cause your footage to appear blurry or dirty. Instead, manufacturers recommend investing in a residual oil remover spray and a lens pen. You can clean the lens exceptionally well by spraying a small amount of residual oil onto a Q-Tip and running it over the glass. If you use a lens pen, it is specifically designed to pick up any dust, oils, or even fingerprints that are on the lens. Its unique padding also comes equipped with a cleaner, so there’s no need to saturate it before using. When looking through various dash cams to find a suitable alternative, we decided to go with one that is in the same price range as the Rock Space N56 Dash Cam but has just a few extra features. If you require a dash cam with higher resolution, we suggest looking into the Akaso Dash Cam. It has a maximum resolution of 1296p HD and a 170-degree full angle view. In addition to loop record, parking monitor, and G-Sensor features, it also includes an auto screensaver. You can keep your camera recording even when the screen is turned off, and the gravity sensors on the device have three different sensitivity levels, so you can ensure that you’re covered during unexpected incidents. This dash cam supports a maximum 32GB Micro SD card with class 10 or higher. We were delighted with the overall performance of the Rock Space N56 Dash Cam. It’s incredibly affordable, reliable, and remained in position once it mounted to the windshield. The control buttons on the front of the camera make it easy to navigate, and the features work as described. All of the recording footage from both daytime and nighttime was also clear, and we were able to pick up faces and license plates. The only thing that might have made the experience better is if the package included additional cable clips for fitting the dash cam. The cable is quite long, and it required some techniques to get the camera fitted correctly. Outside of that, the camera is definitely worth the buy. Just ensure that you purchase an SD card before you start trying to record. See you on the roads!